Why might one attend RISE? 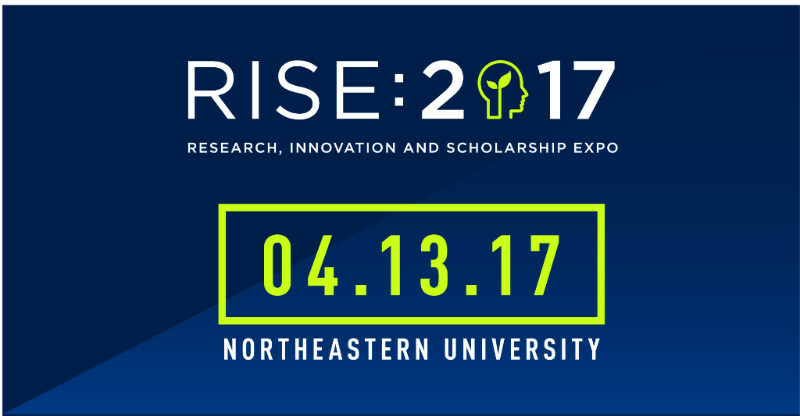 Home > News > Why might one attend RISE? 06 Apr Why might one attend RISE? As I sit at my desk preparing to write an article about why one should attend Northeastern University’s Research, Innovation, and Scholarship Expo: RISE, I hear the constant sounds of construction: the scrapping of bobcats, the thudding of jackhammers, the ever-persistent generator. I see cranes swirling in the sky providing materials to neon clad, tool-wielding masters of modern construction. I look at the buildings and ponder: Why? 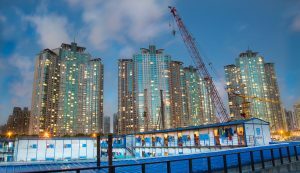 Why do we build? Why do we work? Why engineer? Why design? My initial answer: utility. However, utility is only one component. There is more — we are fundamentally creative. It just pours out of us. Some build with concrete and steel, some with words, some with genes, some with numbers … but, we all build. Different materials, different means, sizes, significances — yet, essentially, we all build. We all create. My thoughts return to RISE. 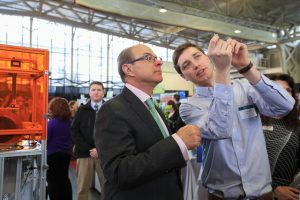 At RISE, industry leaders, entrepreneurs, investors, researchers, and technology enthusiasts from diverse sectors engage more than 400 of Northeastern’s solution-focused innovations. Innovations that students and faculty have expended substantial ingenuity, energy, stress, and money to conceive, develop, test, and exhibit. In essence, RISE mirrors in microcosm the human impulse to create. Although, the technologies exhibited at RISE have a distinct creative flavor — they are innovative — and innovation is the product of solution-oriented creativity. So why should one attend RISE? To see one’s own reflection in the pool of innovation? Unlikely. … to celebrate the creative spirit manifest through the skills of another? Possibly. … to draw inspiration for one’s own research? Imaginable. … to discover solutions to pressing problems? Probably. … to spy a lucrative investment? Feasible. … to recruit some of these impressive innovators? Could be. To access myriad opportunity, some of which may be intentionally sought while some serendipitously discovered? Most definitely. Reasons for attending RISE are as diverse as the ways in which creativity takes shape through human activity. Okay, maybe not that diverse, but, they are numerous and worthwhile acting on. To find your reason for attending RISE, watch this brief video. If you already have your reason, register to attend. Cover photo by Grand Homes Reviews. All Rights Reserved. Embedded photo 1 by g.m.kennedy. All Rights Reserved. Embedded photo 3 by jakMotyle. All Rights Reserved.